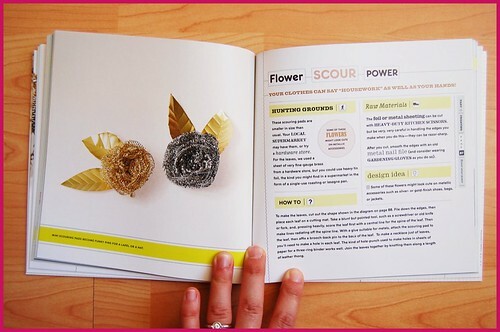 June 11, 2008 by tricia royal in amazing art, book peeks, crafty cool-, fashion musing, this inspires me! 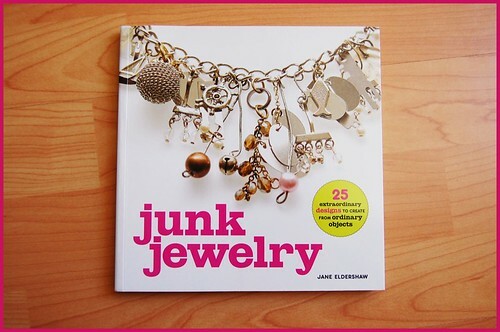 several weeks back, i got my hands on a super cool little jewelry-making title entitled junk jewelry, by jane eldershaw. ms. eldershaw, a jewelry designer who has worked for australian vogue, the new york post, and new woman magazine. junk jewelry, in the simplest terms, is about elevating everyday or ordinary objects to the level of art, fashioning artistic jewelry, and then daring to wear said jewelry in an inspiring way on one's own body. 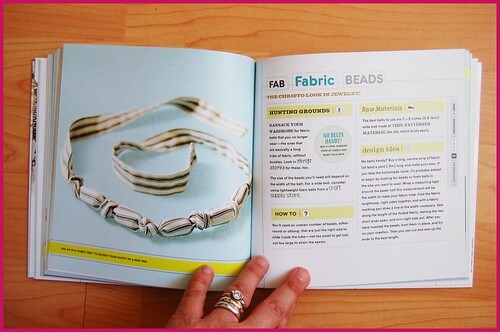 not everyone will take a shine to making or wearing junk or trash-to-treasure jewels...but this book celebrates and inspires those who do. it's a positively sound little jewelry making book that differs from the typical jewelry-making book in a number of areas...particularly in its overall philosophy, approach, and execution...as i'll detail some below. from the outset of her book, jane aims to educate, not just inspire. 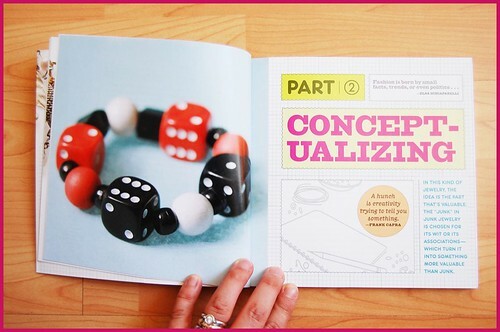 it's not merely a book with projects and pandering explanations...it's jam-packed with tons of food-for-thought and information from the get-go that go beyond the basics...it's really a course on art, art-making, and style. junk jewelry is broken up into four parts. part one deals with the historic origins of junk jewelry, giving the reader and budding jewelry-maker/designer a little education on the trash-to-treasure movement, informing the reader on notable art trends that inspired and birthed a rage for junk/offbeat jewelry, particularly the dada and surrealist movements (many of the artists in said movements actually dabbled at jewelry design). jane also highlights a litany of iconic fashion and accessory designers of past and present who used junk to great effect when creating their jewels, including elsa schiaparelli, karl lagerfeld, moschino, coco chanel, paul smith...and many more. part two is all about the conceptualizing process. jane shows the reader how to think like an artist, and illustrates a myriad of artistic techniques, all to get the reader/budding designer's mind spinning. some of jane's suggested artistic techniques that i really adore and find really inspiring include "elevating the mundane to art status by isolating it" and "for unity, group by color shape or texture". 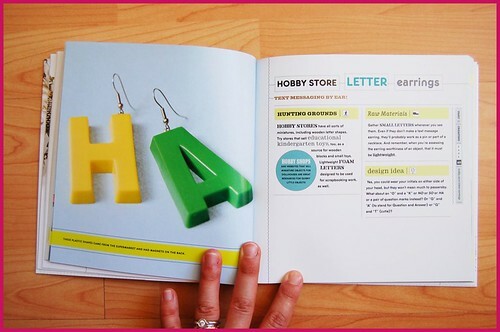 the third part of the book is the creating section...it's the part with all the projects. most of the projects jane has in the book are simple and spare in appearance, a tactic i think is really a great move, design-wise. showing off simple projects makes for easy completion, which is of course gratifying for beginners and appealing to minimalists, but i feel like keeping the projects and photography of said projects simple also looks visually clean, and gives those who desire the moremoremore a clear, inspirational jumping off-point for their own, more chaotic, or daring designs. said folks can look at a simple project or nicely shot photo and easily see where they'd care to add this or that, i.e., how they'd change the project to add their own idiosyncratic flair. 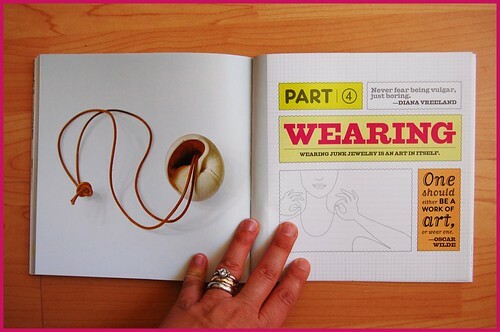 the last bit of the book focuses on the wearing of junk jewelry...it's a little primer on the art of wearing your quirky baubles (handmade by you, or otherwise) with panache and attitude. here, jane touches on sound accessory and clothing styling principles that range from donning your jewels with an eye and mind for "suitability", focusing on a "focal point", or dressing around a "theme" (and several more, natch). said suggestions are so strong, they move beyond the styling of junk jewelry...they find relevance and context in the styling of oneself in general. i feel compelled to mention a nice bonus feature of junk jewelry that metaphorically speaks volumes about the book as a whole: from front to back/cover to cover, the book is peppered with great quotes, hand-selected by jane, that touch on art and art-making, as well as fashion, implying there is a strong thread between the two, a notion i wholeheartedly support and share. this implied relationship between art and fashion as seen in her book is, i'd guess, a reflection of what jane's ethos just might be...that making (junk) jewelry, and the results of said making, are not just fashion, they can also be art. 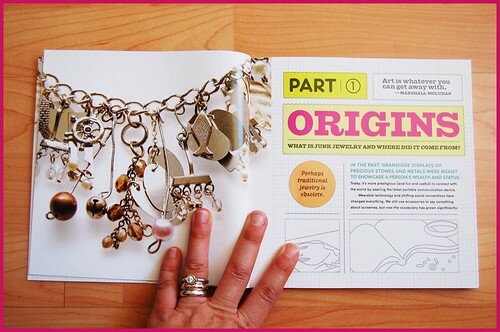 in this book, she's not just showing you how to make jewelry or follow instructions on a project...she's giving you the tools to be artistic, *and* stylish, too. all in all, very, VERY cool. 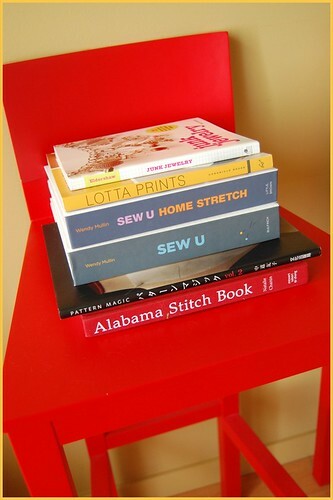 amazing art, book peeks, crafty cool-, fashion musing, this inspires me!